Anyone interested in volunteering needs to come and fill out our volunteer application. 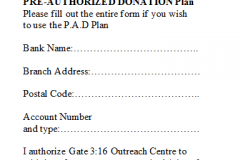 Please specify where you would like your donation to go to when donating online through Canada Helps! Donating to a fundraiser? Let us know! This helps us sort our donations and gets your money where you meant for it to be! Or use our pre-authorized donation form! Just print this form, fill it out and bring it to the Gate! Our walkathon is always in the late Spring when the air is refreshing and the birds are singing. This is a great time to get those Walkers on and shape up for the summer. We walk an easy 5 Km. Walk along the Oshawa Creek Trail. It is a beautiful walk starting at the Gate, taking you down to Lakeview Park and back again. It is about an hour’s walk and there are benches at the park to rest if needed. We always provide coffee before you start and goodies and water when you get back to rejuvenate you for your day’s activities. If you are able to raise $20 for the Gate, you will receive our Gate T-shirt. Come have fun with us and start your summer right. This dinner is held mid Nov. in the event room of Durham Christian Homes. We have a lovely chicken or roast beef dinner and desert. We enjoy a bit of singing, fun entertainment, and door prizes. We even have a small silent auction to add to the fun of the evening. We will be including some Christmas baking in the auction, so if you want to get a head start and put away some goodies in the freezer, bring along some extra spending money. If you are looking for a nice evening out and an opportunity to support a good cause, this is the event for you. Give us a call and reserve a ticket. If you can get enough of your friends together, you can have a table of 8 to yourselves. Let us know and we will reserve it for you. If you work for a company who would like to sponsor us, for $500, we will put their name on the table and will be recognized that evening in front of our 140 guests as well as in our winter Newsletter. Food Fancy is a way for you to donate and receive a grocery gift card to give back to someone else that you may know personally who is having a hard time. It would be a great gift at Christmas. You just donate $100 and receive a $25 gift card and a $75 tax receipt to help on your tax deductions in the New Year. It is a Win, Win situation for everybody. For more information, click the link below for the printable food fancy flyer! XL heavy duty garbage bags.